Today, the implementation of a process management and control system seems not a spectacular task. The principle technologies, IT-systems and also related standards such as ISA95 are well known. Also supporting organisations like the “Manufacturing Enterprise Solutions Association” (MESA) and guiding principles such as VDA 5600 do exist. However, the specific implementation of a manufacturing execution system incorporating business processes and manufacturing processes is still challenging and expensive. It is not only an IT task moreover it effects the enterprise organisation in terms of processes and organisational structure. The project procedures cover the project steps, results of the different project phases and required parallel actions such as the master data reorganisation and maintenance. The modelling method used was the integrated enterprise modelling (IEM) within the MO²GO system. The project starts with a business process analysis on the basis of a related enterprise model. The model covers processes, process interfaces, organisational units, IT systems in use, documents and other required resources. The modelling involved all process owners who might be affected by the discussed manufacturing execution system (MES) from the management area to the machine operators. The resulting as-is-model has been modified by substituting the existing IT system fragments with functionalities of an expected integrated manufacturing execution system (MES). In parallel, a functional analysis supports the identification of the required functions related to the operational processes of planning, control and production. This leads to an initial model reflecting the process support of the MES system. The results of the process analysis and functional analysis created the content of a functional requirement book and the foundation for an evaluation of performance indicators to approximate the return of invest (ROI). The ROI approximation was one element to convince the senior decision makers to continue with the project. The results of the integration of MES components into the model have been added to the “functional requirement book”. It covers now the specialised system functionalities and a specific enterprise model reflecting the functions of the selected system in the operational processes. 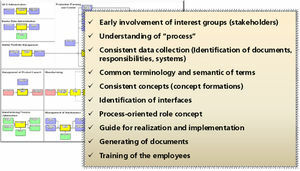 The coherence of the different (local) activities was provided by the enterprise model expressing the interrelations between the different processes. For example missing transitions and interfaces between processes as well as the impact of decisions within the implementation of the MES are expressed by the model. The modelling approach is supported by the enterprise modelling tool MO²GO applying the integrated enterprise modelling method (IEM). The method and tool supports a fast and consistent enterprise modelling approach and a good communication base. Extensions of the tool support consistency checks and the role definition in project step 9 and 10 as well as the test phase in project step 12.